Gramophone records are one way in which the great jazzmen survive, but pictures are another. In fact, we do not have recorded sound of several pioneering jazzmen, like Buddy Bolden or Emmett Hardy, but we do have photographs. I have always had an interest in those photographs of early jazzmen and try to find the obscure ones for our Dutch jazz magazine Doctor Jazz. At one time I decided to make a listing of all known photographs of Jelly Roll Morton and King Oliver. In Doctor Jazz No. 94, dated December 1980, I published my first effort at what I called a “Picturography” of Morton. It listed thirty-one photographs. Since then several more photographs have surfaced, more than enough to justify a full refresh. Also, I discovered that the art world calls this type of listing an “Iconography.” It was at Mike Meddings request to produce the update for his Jelly Roll Morton website, which finally triggered me to revisit my old listings. I was amazed to see how much new material had become available. Although a great deal of literature has been checked, I am convinced that much still needs to be uncovered. What is of particular importance is the first publication date of each photograph. I am still finding earlier dates and additional information than what I have in my list. When Morton photographs were published in books or magazines, they were usually trimmed. One book might trim the left side, and another book the right side of a photograph, but rarely would it be printed in full. I have tried to identify these anomalies and attempted to take the best available print for publication on this site. An example is the famous 1929 Victor Camden studio photograph of Jelly-Roll Morton and his Orchestra. Each time I have seen this used, it stems from the same source, a damaged and mutilated print. Usually some of the damage has been “repaired” by filling the half-round hole on the bottom. Where is the original of this photograph? Two books contain many photographs of Jelly Roll Morton and are fundamental to his story; Laurie Wright’s “Mr. Jelly Lord” and Bill Russell’s “Oh, Mister Jelly” and I have consulted these publications as points of reference in the Iconography. In addition to the “Iconography Library,” I have compiled separate sections, which include the very best of “Caricatures and Drawings” and “First Day Covers” that feature Jelly Roll Morton. Mr. Jelly Lord — by Laurie Wright, Storyville Publications, Chigwell, Essex, 1980, 256 pp. Oh, Mister Jelly — A Jelly Roll Morton Scrapbook, compiled by William Russell, Jazz Media ApS, Copenhagen, Denmark, 1999, 720 pp. A Pictorial History of Jazz — People and Places from New Orleans to Modern Jazz, Orrin Keepnews and Bill Grauer, Jr., Crown Publishers, Inc., New York, 1955, 282 pp. Black Beauty, White Heat — A Pictorial History of Classic Jazz, 1920-1950, by Frank Driggs & Harris Lewine, New York, W. Morrow, 1982, 360 pp. Rhythm on Record — A Complete Survey and Register of All the Principal Recorded Dance Music from 1906-36, compiled by Hilton R. Schleman, Melody Maker, 1936. Ferdinand “Jelly Roll” Morton: The Collected Piano Music — Edited by James Dapogny, Smithsonian Institution Press, Washington D.C. 1982, (Soft Cover) 528 pp. Dead Man Blues - Jelly Roll Morton Way Out West — Phil Pastras, University of California Press, Berkeley and Los Angeles, 2001, 270 pp. Ate van Delden — Letters and information to Mike Meddings, dated 15th April and 5th July 2009. Music — Magazine International Du Jazz, issue No. 80, Vol. VIII, dated April 1932, Belgium. Metronome — dated August 1941, page 10. Courtesy of Roger Richard and Ate van Delden. The Music Trades — Article dated 21st June 1924, page 29. Courtesy of Mike Montgomery. Jazz Journal — Jazz Journal magazine, dated February 1963, Vol. 16, No. 2, page 10. Al Rose — Storyville, New Orleans: Being an Authentic Illustrated Account of the Notorious Redlight District, University of Alabama Press, Tuscaloosa, Alabama, 1974, 225 pp. Al Rose and Edmond Souchon — New Orleans Jazz: A Family Album, Louisiana State University Press, 1967, 320 pp. Victor Record Review — Volume 2, No. 7, 1939, pp. 8-11. The Milwaukee Journal — dated, 18th August 1927, page 8, column 1. Courtesy of Prof. Alan Wallace. 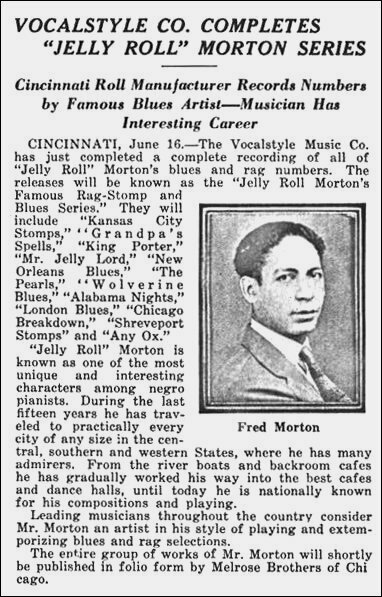 Washington Daily News — Jelly Roll Charts Jazz, dated 19th March 1938, page 6. Courtesy of Prof. Alan Wallace. The Melody Maker and Rhythm — dated 1st December 1951, Vol. 27, No. 950, page 9, Courtesy of Neil Aldridge. Ralph J. Gleason — Jam Session: An Anthology of Jazz, Peter Davies, London, 1958, following page 128. Jazz Journal — dated July 1954, Vol. 7, No. 7, page 26, column 3. Courtesy of Millie Gaddini. Samuel Charters & Len Kunstadt — Jazz: A History of the New York Scene (1962), page 233. Jazz Journal — dated October 1968, Vol. 21, No. 10. Frank Büchmann-Möller — Is This to Be My Souvenir? Jazz Photos: From the Timme Rosenkrantz Collection 1918-1969, Odense University Press, 2000, page 135. Charles Peterson — Swing Era New York: The Jazz Photographs of Charles Peterson, Temple University Press, Philadelphia, 1994, 220 pp. 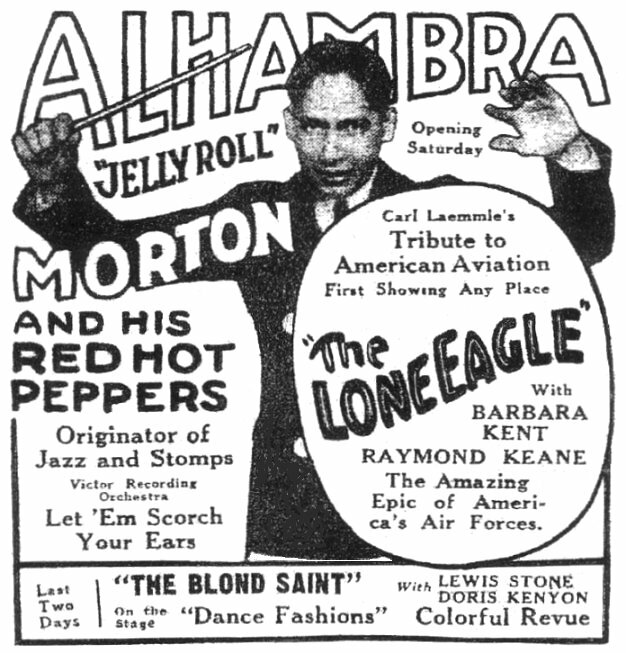 “Jelly Roll” Morton’s Famous Series of Blues & Stomps for Piano — Folio No. 1, published by Herman Darewski, London, c. 1944. Rudi Blesh — Shining Trumpets: A History of Jazz, Alfred A. Knopf, New York, 1946. 365 pp. David Stone Martin — Vogue 10-inch LP LDE 080 cover, 1954. Courtesy of Robin Penna and Malcolm Lee. Classic Jazz : A Personal View of the Music and the Musicians — Floyd Levin, University of California Press, Berkeley and Los Angeles, 2000, 358 pp. Jazz Journal — dated February 1951, Vol. 4, No. 2. The Indianapolis Freeman — dated Saturday, 13th June 1914, page 5, column 2. Courtesy of Prof. Alan Wallace. The Record Changer — dated July—August 1951, page 14. Courtesy of Peter Hanley. Frog-i-More Rag — Sheet music cover of Frog-i-more Rag, published in 1947 by Roy Carew, 818 Quintana Place, NW, Washington, D.C. (photograph courtesy of Dave Stuart of Jazz Man Record Shop). Courtesy of Peter Hanley. Peter Hanley — Letter and information to Mike Meddings, dated 30th January 2006. The Record Changer — dated September 1950, Vol. 9, No. 8. Courtesy of Richard Hadlock and Gene Deitch. Zach Trenholm — Letter and information to Mike Meddings, dated 23rd July 2007. Jazz Record — dated May 1947, No. 55, page 11, column 1. Courtesy of Brian Goggin. The Record Changer — dated December 1948, Vol. 7, No. 12, page 12. Courtesy of Richard Hadlock, Gene Deitch and Peter Vickers. New York Dramatic Mirror — Bloom photograph studio advertisement, dated 4th June 1921. Courtesy of Prof. Alan Wallace.